On the vanishing blog. Have you ever visited a blog one day, maybe even posted a comment or two, only to have 'WEBSITE CANNOT BE FOUND' come up when you search for it a few days later? Or, more disconcertingly, 'BLOG HAS BEEN REMOVED'? It's happened to me a couple of times in the past year, and it always leaves me a little flummoxed. I mean, I can understand someone deciding to take a blogging break, or even stopping altogether, but to make your blog vanish without a trace from the internet? What makes someone decide to do that? On the irresistible library book sale. All the sign has to say is Paperbacks--5¢ and I suddenly find myself with an armful of books I wouldn't normally buy. But when they cost so little I just can't seem to resist. Ten books for 50¢! Could you resist that? Even if I never read any of them I'm only out two quarters. That's the kind of risk I can afford. And sometimes I get lucky and find a book or two by an author I love. 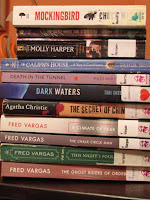 Like last month when I found four Fred Vargas novels, an Agatha Christie mystery, and my favorite Molly Harper fantasy. I love the bookish serendipity that can occur at these sales, but I hate the sense of urgency I sometimes feel knowing that this may be my last chance to read any of these books. Which is probably why I also ended up buying 5 other paperbacks I've never read but that looked good, adding to my ever-growing TBR pile. But let's not talk about that. So, happy splurging at the next library sale near you. 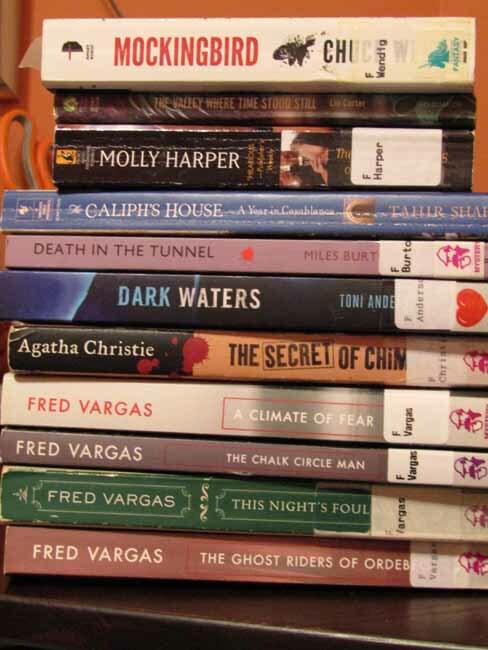 I know what you mean about the fun in going to the library and picking up an armful of books for 5 or 10 cents a piece. And its usually among the used book piles that you find not only books you have heard of but books that no one has heard of anymore. Those books always fascinate me where the title and the author have slipped into obscurity decades ago and yet whoever wrote the book probably put their heart and soul into it and who knows it might be wonderful and just the kind of book you've been waiting for. I love finding books like that! Our libraries are useless. The only books for sale are either falling apart or are books nobody wanted to read! The last time I bought one was about twenty years ago! I wonder why people just take down the blog without saying anything to their followers? That's so sad that you never have any good library books for sale in your neck of the woods...but maybe that means your library is actually keeping more books on its shelves? And isn't that weird when a blog just disappears? I'd prefer a little post saying good-bye or something. I don't think I've heard of Molly Harper, so that's someone new to explore! 5 cent sales only happen rarely at my library...usually when they've just culled their shelves or gotten lots of used book donations. But I love it when it happens! This looks like a stack I’d bring home from a thrift store and they’re $1.00-$2.00 in price. .5 cents? No way I could resist that. I do love a book sale and never pass one by. For 5 cents I would scream out loud with joy, I've not seen that low a price. Blogger seems to shut down blogs that are not kept alive with new posts. Sometimes I see a "this blog name is available" with a notice that the blog has stopped. It seems sad. I'm always sad when a book blog I follow disappears. Most just stop posting but leave up the blog, but there are those, as you described, who remove the blog. Sometimes it turns out to be just a glitch and I can find the blog a few days later, but not if it is a blog removed message. Library sales are hard to resist! OMG, five cents a book! Unheard of. I thought 50 cents was cheap. Excellent haul, BTW. I have heard good things about Fred Vargas books but have yet to pick one up. I have read that Agatha title, it is one of the non-Poirot/Miss Marple titles. I hope you like it! I recently picked up an old paperback copy of Nemesis since I have a real hankering to have her books on hand for when I need a dependable pick-me up read. P.S. yes, I don't like it when people delete their blogs or vlogs without any warning. It is their prerogative, of course, but I wish they would give notice and leave the posts up. I like often to go back and read an old review once I have read the book. I am always so sad to see a blog disappear. It is almost worse when I visit a blog and see that they haven't posted in months. I do love library sales. They are never $0.05 a copy for me though. The last day of the sale they have a $5.00 bag sale and I usually stock up then. Nice haul! 5 cents? Wow! That's a great bargain. I wouldn't be able to resist either. It's amazing how many blogs have disappeared in the time I've been blogging. Most of them just aren't updated anymore, but some are totally deleted. Maybe it's bloggers who want to be authors and think their reviews might hurt them in some way?? I've heard of that happening. Oh, I hadn't thought of that reason with disappearing blogs. I bet you're right. I can relate to the vanishing blog problem! It usually happens when I discover a new blog and I think 'Oh this is good' and then they begin to post less and less! And good luck with the new books, always great to have some new ones to discover. Ooh, I love Fred Vargas. Good deals. I'm guilty of similar lapses. Like when I'm weeding books at work (library) and I see ones that I haven't read that look interesting and drag them home. I've had that happen with disappearing blogs as well. It confuses me too! And wow, 5 cents! If I found paperbacks for 5 cents, I'd end up with an armful too!